More than 100 years of history of making of high quality guns, Carabinas Cometa are Spanish specialists in the development of craftsman-built air guns. All components of Cometa airguns are manufactured in Spain. In particular, the main parts of the airguns - the barrel, stock and tube - are manufactured and controlled by Cometa itself. All the airguns are individually tested and calibrated. 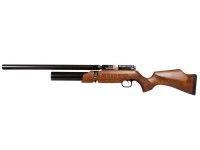 AirForce International started distribution of fine Cometa airguns in 2012.